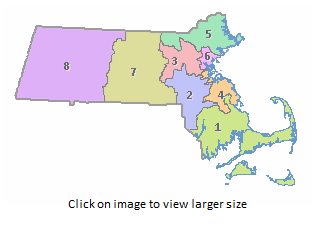 The Massachusetts Governor's Council Districts datalayer reflects the eight voting district boundaries as established by the Massachusetts General Court Special Joint Committee on Redistricting. These boundaries took effect in January 2012, and members are based on the results of the November 2018 elections. The name of the statewide datalayers are GOVCOUNCIL2012_POLY and GOVCOUNCIL2012_ARC. 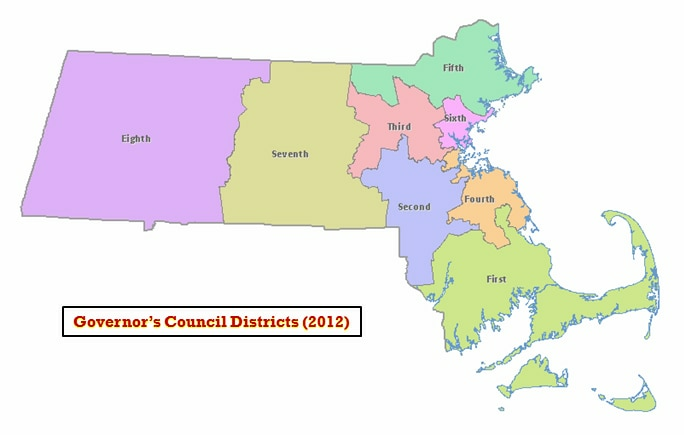 Staff at the Massachusetts General Court Special Joint Committee on Redistricting developed this layer with its contractor, Caliper Corp. (Newton, MA), using Maptitude for Redistricting software. MassGIS appended the 1:100,000 coastline and state outline and added the Councilor's name and party attributes. MassGIS will update the layer as needed.